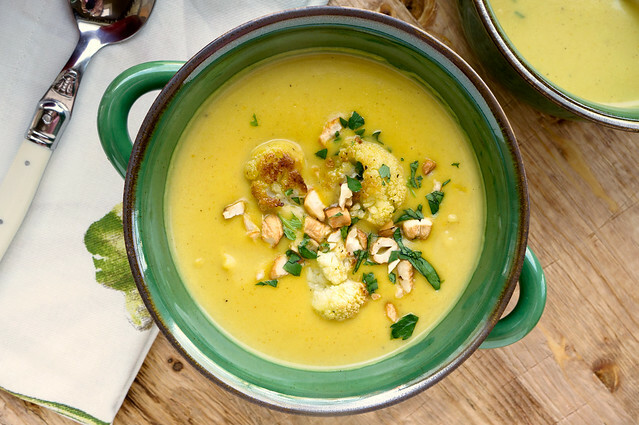 With roasted cauliflower florets, mild curry, and a touch of Major Grey’s chutney, this creamy Curried Cauliflower Soup is delicious and easy. I haven’t been able to turn on the news lately without hearing those two awful words that plagued us last winter: Polar. Vortex. Really? That’s so last year, Mother Nature. I was hoping we could call a truce and eke out the freeze here in New Jersey until after Thanksgiving, but seeing as we’re already dipping into the low-40’s, I have my doubts. 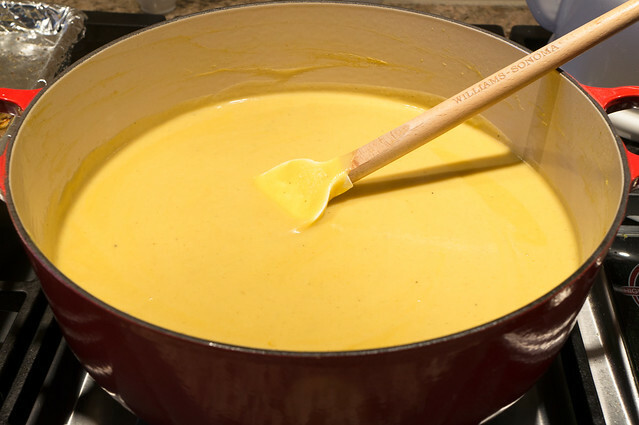 If there’s any consolation to the thought of those bottomless piles of snow making a repeat performance this winter, it’s that soup season is upon us! When it’s cold out, I can think of few things more comforting than a pot of soup simmering on the stove. The mere thought of it is instantly warming. I love puréed roasted vegetable soups, but when working with cauliflower as the primary ingredient, find that they can be a little bland. I often up the ante with aged cheddar and bacon, but (I can hear the Internet fury rising as I type this): it gets tired after a while. 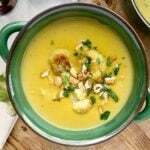 For something different, this lightly-spiced Curried Cauliflower Soup has been a hit amongst my family and friends. I like to roast the florets to deepen their flavor before simmering them in a curry-infused broth. Taking a cue from a vegetarian slow cooker book I bought a few years ago (I love to collect books across different cuisines and disciplines; I’m such a cookbook hog), a little Major Grey’s chutney before puréeing ties everything together and gives the soup a slightly sweet finish. A few cashews on top (and extra roasted florets, if you like), and you might just have a new favorite way to enjoy cauliflower. I’ll be honest: I resisted cooking with curry powder for years after a rather traumatic unforgettable restaurant experience in college. I’d ordered my first curry dish ever, which was so off the charts on the heat scale, I didn’t think my tastebuds would ever recover. A decade later, I related my tale of woe to a curry-loving friend who insisted that I give the cuisine another try. I was skeptical, but tentatively dipped my toes back into the curry waters and was surprised to discover a vast array of powders and pastes available to me. One of the best parts of roasted vegetable soups such as these is how easy they are to make (while tasting like you’ve been slaving in front of the stove all day). There’s a lot of bang for your buck in the effort to flavor ratio here. After roasting the cauliflower, all that’s left to do is sauté, simmer, and purée. For a light weeknight meal, the cauliflower can even be roasted in advance, putting a tureen of soup on the table in under an hour. Here’s hoping the polar vortex (and “bomb cyclone” I just read about–what?) decide to take a turn for parts unknown and spare us their chilly wrath. One thing is for certain: regardless of what Mother Nature throws at us over the next few months, my soup pot is going to be at the ready! Did you know? Clicking the photos in the body of any post will take you to my Flickr feed, where you can view more shots taken during the cooking process. 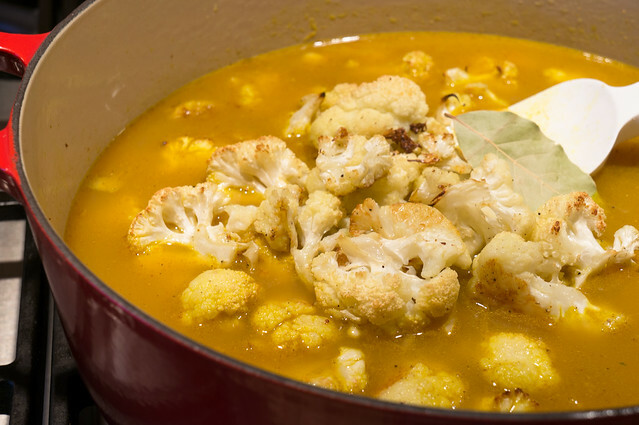 With roasted cauliflower florets, mild curry, and a touch of Major Grey's chutney, this creamy Curried Cauliflower Soup is delicious and easy. Preheat oven to 400 degrees F. Place cauliflower florets on a foil-lined baking sheet. Toss with 2 tablespoons olive oil, 1/2 teaspoon kosher salt, and 1/2 teaspoon freshly-ground black pepper. 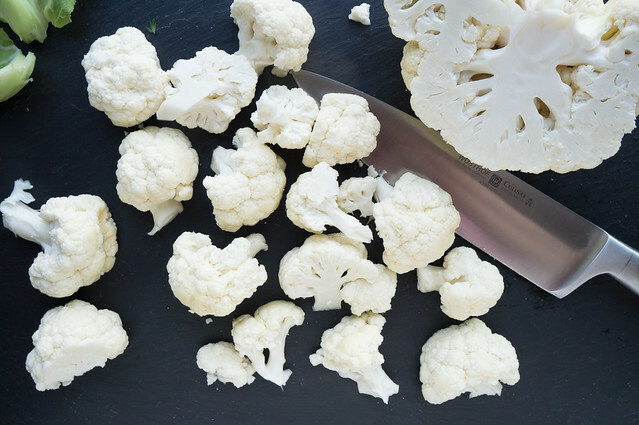 Spread cauliflower in a single layer. Bake 40 minutes, until cauliflower is tender and golden brown, turning florets halfway through. Heat remaining 2 tablespoons oil in a large pot until shimmering. 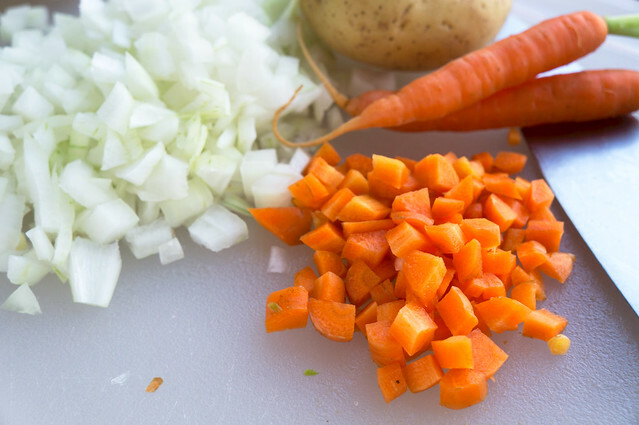 Add chopped carrots and onions and sauté over medium-high heat until vegetables begin to soften, about 5 minutes. Stir in curry powder and cook for 1 minute, until fragrant. Add stock, scraping any browned bits off of the bottom of the pot. Stir in roasted cauliflower, diced potato, and bay leaf. 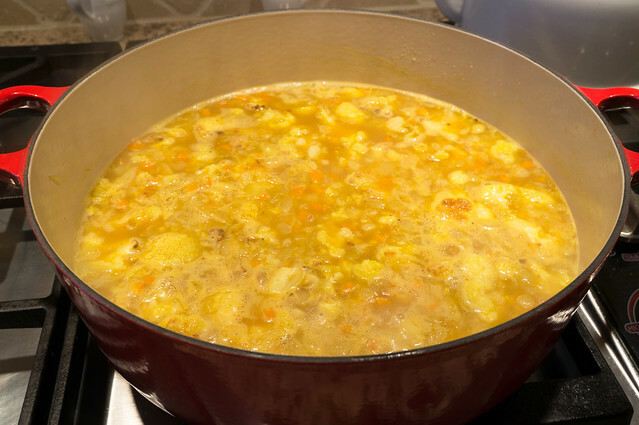 Bring to a boil, reduce heat, and simmer, partially covered, until cauliflower and potatoes are very soft, about 30 minutes, stirring occasionally. Return puréed soup to pot and add heavy cream, if using. Season to taste with additional curry powder, salt, and pepper. If soup is too thick, add a little bit of water or stock to thin. Serve, garnished with chopped cashews, chopped parsley, and additional roasted cauliflower florets, if desired (see note). 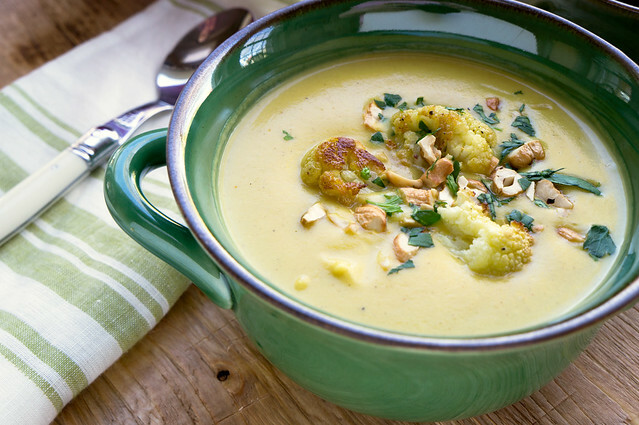 *I love roasted cauliflower and the textural balance of a few chopped florets against the puréed soup. So, I often roast a second head of florets while the soup is simmering for snacking and garnish. This is, of course, totally optional; the soup is equally delicious as a smooth purée. **This is a bit of a range, I know! The amount of curry powder you use will depend on your personal heat preferences and the profile of the blend you buy. Since curry powders vary so greatly across brands and mixes, it's always a good idea to start conservatively and adjust to taste. It's always easier to dial up the spice by adding more curry powder than to balance out soup that's too spicy. Made this recipe over the weekend. It was AMAZING. I couldn’t find any mango chutney at the grocery store so I had to make my own… but that was a fantastic experience too. I’ll definitely be making both those recipes again VERY SOON! Thank you for sharing!! Your comment absolutely made my day, Sacha-Bea! I am so glad that you enjoyed the soup. Homemade mango chutney sounds fantastic. I’m definitely going to have to give that a try myself, thanks for the inspiration!